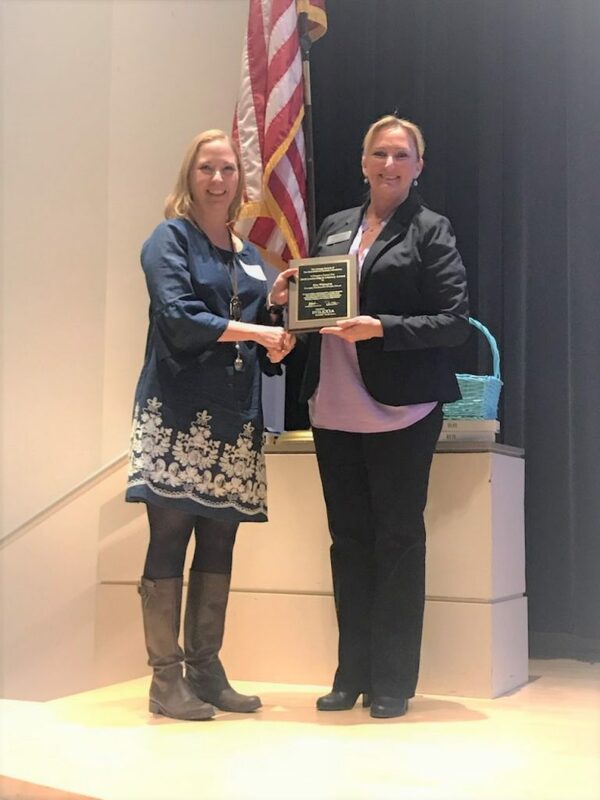 Kim receiving the Leadership in Literacy award from Karen Huppertz, President of International Dyslexia Association Georgia Branch. 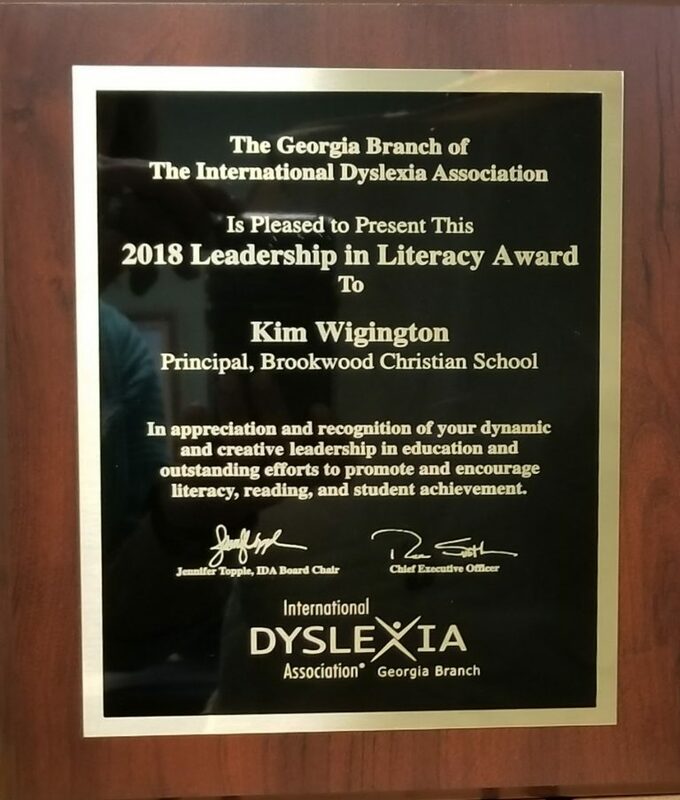 Principal Kim Wigington was awarded the 2018 Leadership in Literacy Awaard by the International Dyslexia Association, Georgia Branch (IDA-GA) on Saturday, March 24 at IDA-GA’s Dimensions of Dyslexia Conference to be held at Georgia Tech Research Institute in Atlanta. 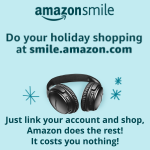 ♦the engagement of parents in school/home cooperative ventures to support literacy. We, at Brookwood Christian, are extremely proud of her dedicated service to education and outstanding efforts to promote and encourage student reading achievement. Kim is a Georgia native, growing up in Calhoun, Georgia. She taught high school English, speech, drama, and psychology for 6 years at Cartersville High School, then worked as a school counselor for 4 years at Allatoona Elementary School, where she won a regional school counselor of the year award. 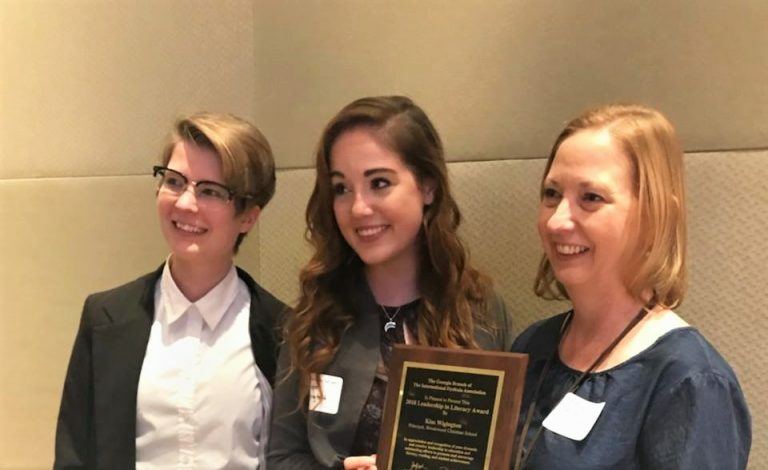 Having a daughter struggle with dyslexia and realizing the lack of adequate resources and services offered in public education, Kim started what would grow into Brookwood Christian School in 2004 by creating the perfect learning environment for her daughters and other children struggling with learning differences. Many have witnessed her tireless efforts to expand the schools reading programs as well as community awareness of dyslexia and other language processing disorders. Brookwood Christian School serves students who have not been successful in public or private schools due to their unique learning needs. Many of these students have been diagnosed with a language based learning disability such as dyslexia and were either on an IEP in public school or eligible for one had they attended public school. We use Wilson Reading® and Fast ForWord® reading programs, depending on the students’ needs, and class sizes are kept small so students get the individual attention and appropriate instruction they need for success. Teachers are certified and experienced in the content areas they teach. Those teaching the reading programs have had extensive training in those programs. For the 2016-2017 school year, the average gain on the Woodcock Johnson IIIC broad reading battery was 1.2 grade levels with 45.7% of students gaining greater than 1 year and 91.4% of students gained 1 year or more on at least one of the subtests. The biggest gains were seen on Passage Comprehension with an average gain of 1.8 grade levels and 60% of students gaining more than 1 year and over a third seeing a gain of 3 or more years. Our next goal is to expand our programs to be able to serve more students in need. Because of her accomplishments, Kim was honored with the Acworth Business Person of the Year in December 2014 and then named Acworth’s Citizen of the Year by the Cobb County Chamber of Commerce in December 2016. Kim is the current Chair of the Acworth Downtown Development Authority, Co-Chair of Taste of Acworth Committee, as well as Chair of the Acworth Business Association Women’s Network for 2018. Kim with her daughters, Ineja (left) and Kristen (center), both graduates of Brookwood Christian.